In celebration of Tokyo Game Show, Vault Communications has released a new gameplay trailer for The Evil Within. Developed by Shinji Mikami of Resident Evil 4 and Devil May Cry and the talented people at his studio, Tango Gameworks, The Evil Within takes us on a journey of survival. While investigating the scene of a gruesome mass murder, Detective Sebastian Castellanos and his partners encounter a mysterious and powerful force. After seeing the slaughter of fellow officers, Sebastian is ambushed and knocked unconscious. When he awakens, he finds himself in a deranged world where hideous creatures roam among the dead. Facing unimaginable horror, and fighting for survival, Sebastian embarks on a frightening journey to unravel what is behind this evil force. It Looks beautiful. I find the voice over captivating and alluring. It has a feel all of its own but at the same time gives off an aura reminiscent of Resident Evil meets Silent Hill. I’m looking forward to this game. It looks like Mikami has done it again. It does say it’s a gameplay trailer and I really do hope that it delivers as it appears. The graphics appear smooth and flow quite nicely. I haven’t had the opportunity to try a demo but it looks as if the controls will be responsive and fluid as well. The enemy backstory sounds interesting. If he created that place then wouldn’t it make sense that he wouldn’t want to leave? What god has ever really wanted to leave their creation behind unless drastically disappointed with it? Does the evil spread throughout the world or is it just that one area our detective is in? These are all questions that will be answered in the game hopefully. The monsters very well could be something straight from a drug induced nightmare. Where do these people come up with ideas this freaky? I’m not complaining at all, horror is my favorite genre, but holy cow does this game already scare me. I hope you all will join me in playing this new game and welcoming it into our world. It looks and sounds worthy of our love. 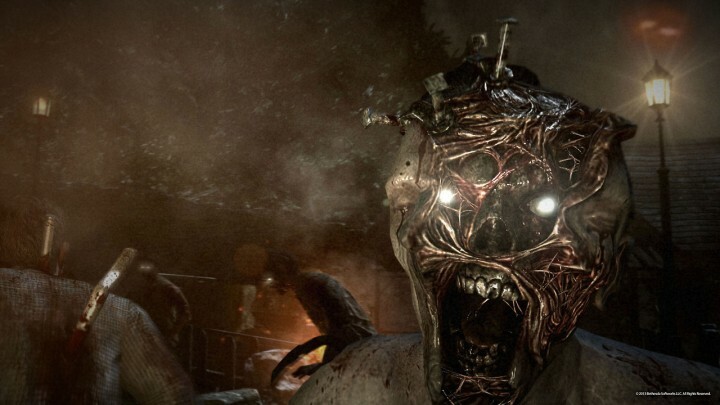 The Evil Within launches on October 14th in the USA and Europe. It will be available on Xbox One, Xbox 360, PlayStation 4, PlayStation 3 and PC.